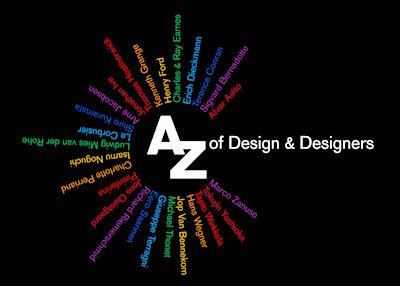 Charlotte and Peter Fiell's A-Z Of Design & Designers, published this week in collaboration with London's Design Museum, is an encyclopedia of 160 designers and design movements. The concept is similar to Design Of The 20th Century, by the same authors. Design Of The 20th Century contains many more entries, though it has not been significantly revised since 1999. The new A-Z Of Design & Designers includes coverage of contemporary design, and is so up-to-date that it mentions the death of Zaha Hadid. It also has a much more elegant layout, with large, well-chosen photographs. The Fiells have written numerous other excellent books on design history, including The Story Of Design, Plastic Dreams, Industrial Design A-Z, and Modern Furniture Classics. The Design Encyclopedia (by Mel Byars) is more comprehensive, though The Bloomsbury Encyclopedia Of Design (edited by Clive Edwards, in three volumes) is the definitive design reference work.